Print is not dead, as many of us thought back in the old days (1990's). Rather, we have seen it compliment the digital age in a way that makes the whole better. What print items of yours could be updated to attract new eyes? Imagination can take the mundane an make it exquisite. This company manufactures custom parts for virtually any industry. Their collateral needed to demonstrate that they could approach any project with finesse and skill unparalleled in the industry. 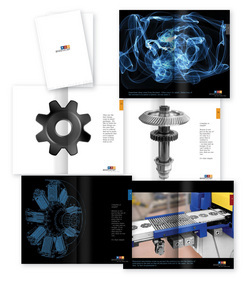 So the booklet I designed and wrote shows a new way to look at parts - as if they were art ready to hang on the walls! See this larger by clicking it. To see each page larger, click the "these may take..." button.